When someone hacks Morgan Edge' car in as part of an attempt to kill him, he is quick to blame Lena Luthor for the crime. James steps in to make sure Lena stays protected as The Guardian, while Kara works to save Lena from the Luthor family temper. Meanwhile, Alex helps Sam to investigate her "lost time" problems. Nobody, but nobody plays smarmy and evil like Adrian Pasdar. The scene of James chasing the poisoner is a good action sequence. Winn speculates that the reason why Reign doesn't require a yellow sun to use her powers and that Kryptonite doesn't effect her is that she's been genetically modified to be different than a standard Kryptonian. The Worldkillers of the original Supergirl comics were the products of genetic engineering. Winn says that General Zod was killed in a battle with Superman. This is likely a nod to the movie Man of Steel, where Superman also killed General Zod. Lillian Luthor makes use of a Lexo-Suit to try and kill Morgan Edge and fight Supergirl and Mon-El. In the comics, the Lexo-Suit is the name given to any of the exo-skeletal armor that Lex Luthor uses to fight Superman. There have been serveral different versions over the years, most of them possessing special built-in weapons specifiically designed for fighting Kryptonians such as red-sun lasers and Kryptonite melee weapons. The Lexo-Suit Lillian Luthor uses has a wrist-mounted dagger made of Kryptonite It also allows the wearer to fly and gives them enhanced strength and durability as well as the power of flight. It also releases energy blasts made of Kryptonite energy from the hands. Mon-El makes reference to fighting a villain named Computo with Brainiac-5 using hacked drones. Computo was a Legion of Super heroes villain who first appeared in Adventure Comics #340 (January 1966). Created by Brainiac-5 to be a computerized lab assistant, it proved too independently intelligent and attempted to start a mechanical intelligence uprising. Sam's symptoms of memory loss and headaches can be signs of a brain tumor, ALS or caffeine withdrawal. Sam's MRI scan indicates a perfectly ordinary brain. When Lena is brought to the DEO, Alex asks for her to be given 200 mg of Phenobarbital - a medication used for preventing seizures, treating anxiety, insomnia, drug withdrawal and to help with surgery. Alex also requests a radial artery line and two red tox for Lena. Alex says that Lena's blood-pressure is 70/palp and her pulse is 30 beats per minute and falling. Alex determines that Lena was given cyanide based on the fact that her breaths smells like almonds. Some people do think cyanide has a smell like bitter almonds, though some forms of cyanide are odorless. Alex prescribes 50 ml of sodium thiosulfate to treat Lena - a real chemical used to counteract cyanide poisoning. 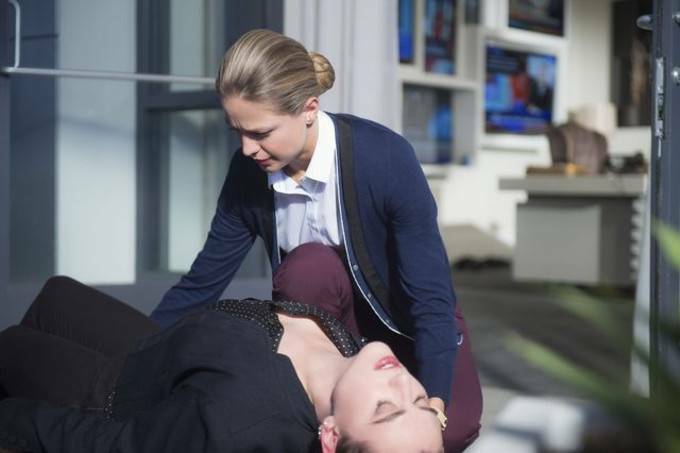 In order to give the antidote time to work, Kara must use her freeze breath to induce hypothermia in Lena, thus slowing her circulation. The bullet that killed Edge's hit-man disappeared without leaving any fragments, casing, shrapnel or exit wound. This indicates that it is some form of advanced technology. The Lexo-Suit is an armored suit Lex Luthor designed to allow him to fight Superman. The Lexo-Suit Lillian Luthor uses has a wrist-mounted dagger made of Kryptonite It also allows the wearer to fly and gives them enhanced strength and durability as well as the power of flight. It also releases energy blasts made of Kryptonite energy from the hands. Winn cross references the meteor impact sites with news reports and hospital records to search for anomalies. This gives him seven people - a Coluan, a Maaldorian, a Phorian and four apparently human females. Alex: (firmly) You know what else causes memory loss? Caffeine withdrawal. Alex: (To Sam) I know what it's like to be afraid to let other people in. I have always been used to dealing with things in my life on my own. So... after Maggie and I broke up, the thought of talking about it was terrifying. But Kara, being Kara, she wouldn't let me shut down. She... forced me to let her in, so that we could figure things out together. That's the only way I'm getting through any of this. And I am not about to let you make the same mistake that I almost made. Edge: What do you want?! Guardian: You poisoned Lena Luthor. Edge: (nervously) No. No-no-no. That doesn't sound like something I would do. Guardian: No. You get people to do your dirty work for you and then you kill them before they can talk. Edge: I don't know what you're talking about. Guardian: Then you'll be happy to know she survived. Edge: No! Actually! I despise her! There's a lot of other people in this city who'd be happy to rid this place of a Luthor. Maybe you wanna dangle one of them over the side of a building before you make an enemy out of me? Guardian: See, that's where you're wrong. I am your enemy, Edge. So you'd better tread carefully. Because if anything happens to Lena Luthor, I will find you. And you won't be walking away from that. J'onn: Alex says Lena will wake up soon. I suggest she does that at CatCo and not at a super-secret government organization. J'onn: This world is a crazy place right now. People acting, reacting, escalating behaviors. Like what Morgan Edge did to Lena. What our lawmakers are doing, sniping at each other, going round and round in circles, not doing any good. It reminds me of Mars before the civil war. (shaking his head) But like my father said, "There is great power in being the calm at the center of the storm. A beacon to show the way." Supergirl is here to remind us on Earth about what is the best in ourselves. That's what's most important. It's more important than if you ever were to catch another bullet. Lillian: You know, you really hurt me, Lena. No matter how hard I try to show it, you still doubt my love for you. Do you know of any other mother who would kill for her daughter? Lena: (sarcastically) No, I don't. Probably a good thing for society. Lillian: I'll never forget the time Cindy Ryan stole your boyfriend. It took you months of planning, but you exacted your revenge! You outed her diary, publicly humiliated her. ruined her life. It was fantastic! Lena: It was also the fifth grade, mother! Lillian: There you go again, devaluing yourself. Kara has a nightmare in which she sees Reign with two other figures. One figure is obscured in shadow but the other one is the woman who survived the car-crash at the end of 311. Mon-El says The Legion have fought many genetically-engineered beings. Mon-El says that The Legion fought General Zod at one point in their past/Earth's future, requiring Brainiac-5 to find some Kryptonite. According to Winn, General Zod is dead and Superman killed him. Alex worked in Seattle as a doctor before joining the DEO. Lena refers to the events of 305 and Morgan Edge poisoning children just to make her look bad. Reference is made to the prison break during Reign's attack from 310 and how all the prisoners, except Thomas Coville, have been recaptured. Lena refers to Morgan Edge's previous attempts to have her killed in 305 and 309. Alex is able to draw blood from Sam without issue. James refers to a hacker trying to kill Maxwell Lord by taking control of his limo in a similar manner as the attack on Morgan Edge. Lena determines that L-Corp designed a dissolving bullet under something called The Evanesce Project. It was made by a company called Thundercorp. Labs. Thundercorps. Labs turns out to be under the control of Lillian Luthor. Cindy Ryan stole Lena's boyfriend in the 5th Grade. She got revenge by revealing her diary publicly. Lillian describes her son Lex as brilliant but a hothead. She says Lena is capable of planning three moves ahead and plotting her revenge coldly. Sam confirms that her greatest fear is something happening to her and that she won't be there to protect Ruby. This conforms to what we saw of Sam's worst fear when Psi attacked Reign in 311. Lena says that she, Kara and Alex consider Sam to be family and they'll take care of Ruby, no matter what, in case her medical issues turn out to be something bad. Lena confesses to Kara is that she tried to kill Edge back in 305 and tells her that Lillian Luthor is back. Lena was a chess prodigy as a child and earned trophies for her wins. Both Morgan Edge and Lillian Luthor are arrested. Sam's blood tests come back normal, saying that she is perfectly healthy. No signs of a tumor or blood diseases. This does little to ease Sam's fears. Winn's efforts to track potential Worldkillers leads him to seven beings - four seemingly human women and a a Coluan, a Maaldorian, a Phorian. Coluans are green-skinned aliens of great intelligence. Brainiac-5, last seen in 311, is a Coluan. Maaldorians are super-strong natives of the planet Maaldoria a.k.a. The Slaver's Moon. Kara first encountered them in 209. Phorians are a peaceful race of telepaths and telekinetics. The young boy whom James Olsen bonded with in 220 was a Phorian. The woman who survived the car crash in 311 is identified as Julia Freeman. One of the other four potential Worldkillers is named Andrea Towers. One has the last name of Buckingham. The third has the first name of Sarah. Kara recognizes Julia Freeman from her dream at the start of this episode. Mon-El says that The Legion battled General Zod at some point in the future. He refuses to discuss the detals, but apparently Zod was somehow resurrected. Mon-El also makes reference to using hacked drones to fight a villain named Computo with Brainiac-5. A solid episode all around. I don't want to think that this has anything to do with the lack of Reign subplot but I suspect that might be a part of it. The Worldkillers were a highly underdeveloped concept in the original comics in which they first appeared and so far the series done much to build upon it. Still, let's not look a gift horse in the mouth and just be thankful that this week, everything clicked together.